A lovely private double room within our Victorian house with a cute back garden. The house is extremely well located for many tourist areas of London and the local daily markets and shops, including a great 24/7 grocery/deli just 2 minutes away. There are two bedrooms and a bathroom on the top floor plus an open plan lounge and kitchen on the ground floor. In the guest bedroom (the room on offer here) there is a very comfortable double bed with an orthopedic mattress with lovely white Egyptian cotton bedlinen. We supply plenty of white towels. The room rate advertised applies to the guest double room. Generally there is a minimum booking of 4 nights, however, depending on availability, the time of the year and week shorter stays might be considered. Please drop me an email. Music system to link your laptop or iPod. There is a washing machine and tumble dryer. Oyster travel cards (the simplest way to get around, on loan for your stay, just top them up please). Complementary chilled wine and beer in the fridge and croissants, coffee, tea, cereals, OJ and a bowl of fruit for breakfast. 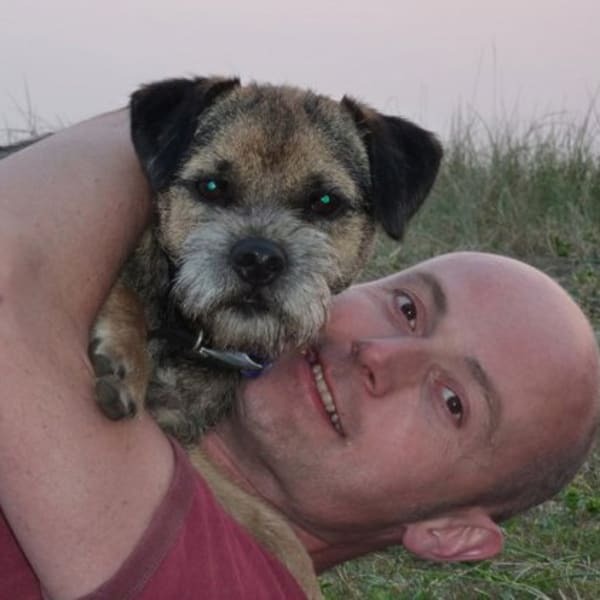 I have a cute, well behaved, friendly little dog called Jarvis (he's a Border Terrier). He's very friendly and lovely to come home to. As well as Kennington and Elephant & Castle Underground tube stations, the apartment is very well served for buses to almost anywhere in London. They're a great way to get around and see things on the way, especially the fabulous views over the river. We are an 8 minute walk from Kennington tube, and 10 minutes walk from Elephant and Castle tube station (zone 1). There are tennis courts, a recently renovated (£8m) park and a gym nearby plus a vibrant local market and many very handy shops just round the corner. Please let me know if you have any questions and we hope to welcome you to London and our home soon! "Mike is a great person, very friendly and welcoming who always ready to help and answer all your questions. He'd provided me with all necessary information how to get to the apartment, guides, umbrellas, food, even oyster card and mobile phone - incredible. His apartment is very clean, cosy and fanky with tiny garden and a good transportation. There's also some shops working round-the-clock which was really, really useful. I can't even imagine how is it possible to stay in hotels after such great experience. To be considerate with noise and to leave the house in the same condition it is found in. Guest parking permits can be purchased, although public transport (tube and buses) are excellent here. There is a very well behaved and friendly small young dog that lives in the house and shares the little garden called Jarvis. ID (e.g. passport) may be requested on arrival. Check-in is usually any time after 4pm (to give us time to clean the apartment). Check-out is by 11am. There is some flexibility depending on other guests and a later checkout may be feasible, please ask. You can always drop off your bags earlier. It would be useful if you could please let us know what time you are likely to arrive and for any details about your flight number in case it is delayed. Many thanks.